Everett, WA - The Everett AquaSox Community Fund launched in 2009 to help fund many community projects, with a focus on education, youth programming and youth sports. Since its inception, the Community Fund has donated over $100,000 in grants to Little Leagues, Boys & Girls Clubs and other local organizations. 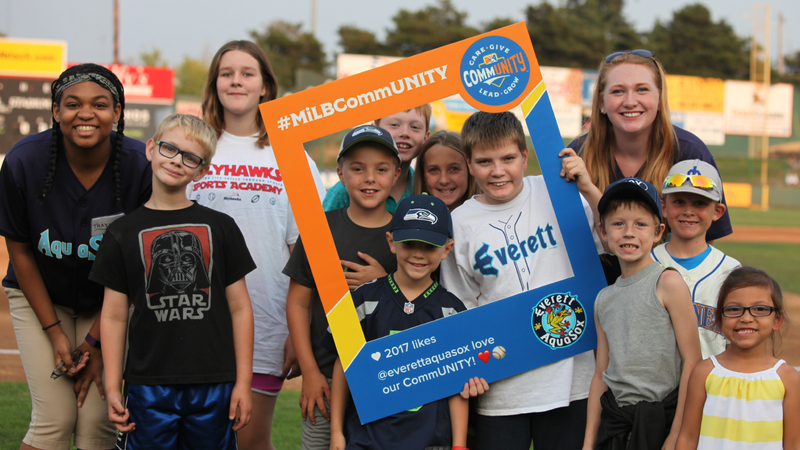 In 2017, the Everett AquaSox Community fund donated $21,307 in monetary donations to several non-profit organizations and foundations in the area. The Community Fund raises money primarily through auctions at the ballpark. The season featured six different auctions with the first auction being the Relay for Life jersey. In addition to the Relay for Life jersey, there were Pink in the Park hats, 4th of July hats, FrogStock jerseys, Star Wars jerseys and the fan favorite, FROGS faux-throwback jerseys. Hit-a-Home-Run in Reading Program increased its enrollment to nearly 23,000 students between Snohomish, King, Island and Skagit counties. Students who read "around-the-bases" received a coupon from Alfy's pizza, Woodland Park Zoo and a ticket to a game with their school. The AquaSox continued supporting the Challenger League by hosting two games in 2017. Each game allowed every player in the Challenger League to show off their skills at the plate, in the field and on the mound. All the AquaSox players participated in both events after their game. Webbly and staff participated in multiple events throughout the season. This included Camp Erin, Socktoberfest, Celebrate Schools 5K, National Adoption Day and more! If your organization has an event you would like Webbly or the AquaSox staff to attend, contact Ashlea LaPlant at (425) 258-3673 or at ashleal@aquasox.com. Click here to vew the complete 2017 Community Relations Report.